Cecil Frances Alexander, that most notable and prolific of all the Victorian hymn writers, was born in a well-to-do part of Dublin in 1818. Her mother’s stock had produced a line of Army officers and her father, Major John Humphreys, had seen service in the Marines until wounded and retired. An able administrator and of sterling honesty, he became agent to the Earl of Wicklow in 1825. In that year he brought his wife and family of six away from the city to live near the Earl’s estate in County Wicklow. Cecil Frances, known always as Fanny, was then seven, and they remained there until she was fifteen. The years between seven and fifteen are important in everyone’s life. With little Fanny Humphreys this was a time when three absolutely fundamental characteristics emerged. These would remain notable throughout her long life and grow ever stronger. The first was a compulsion—a necessity for her to write verses almost every day. The second trait was an acute awareness of the beauty of nature and the seasons which she observed in the gardens, the farmyard and the wider countryside surrounding her in Wicklow. Thirdly, she responded unusually wholeheartedly to what she had been taught from babyhood about the life of Jesus and the Christian message. Her family were quietly religious people, but not remarkably so. It was another family, that of her best friend Lady Harriet Howard, who were inclined to have religious discussions at home. Little Lady Harriet was one of the eight daughters of Fanny’s father’s employer, the Earl of Wicklow. The Earl and his Countess were quite grand people, but were on friendly enough terms with the Humphreys family and fully approved of the strong friendship between the girls. A good deal of what Fanny saw and heard from the Wicklows helped to establish a really strong element of Christian awareness in her character. This never left her, grew steadily, and by the end seems to have taken over her whole life. The strong bond with Harriet, together with Fanny’s warm and constant contact with the Wicklows, had two results. First, since Harriet was also a writer and a religious child, she and Fanny encouraged each other in their writing development to the extent that by the age of 15 the two were producing a series of tracts. The second result of the friendship was that Fanny discovered how much she liked small children and how much she enjoyed teaching related to the Scriptures. Opportunities for this came about through the pious and wealthy Earl of Wicklow, a benefactor in the district, notably in ways connected with education and religion. His daughters and Fanny were enabled in their early teens to go into classrooms, in periods of religious education, to hear the children rehearse the Catechism and so on. They could also teach in Sunday School and take part in the visiting of the poor and elderly of the district. The activities of these Wicklow years were considered very suitable for quite young ladies, and turned out to be the seed corn which was to produce in the next 17 years a varied and rich harvest in Strabane, County Tyrone. Fanny moved there in 1832 when Major Humphreys, with the Wicklows’ blessing, became agent in charge of the estates of the Countess’s nephew, the second Marquis of Abercorn, who had just come of age and was soon to marry. Fanny became a favourite with the young Marquis and his wife in the years of her teens and twenties before her marriage at the age of 32. She was particularly popular with the large brood of Abercorn children. My research makes me reasonably sure that Fanny’s father was actually the uncle of his young employer, on the wrong side of the blanket, and so Fanny was in reality an Abercorn cousin. I cannot prove this with documentary evidence, but mention it because if true it could have been one of the factors making her an acceptable friend to the Abercorn household. While she was engaging in real practical and disciplined charitable work and writing which culminated in the publication of Hymns for Little Children she was also mixing in very high social circles, largely in England and Scotland. For example, she was a guest at the Abercorns’ shooting lodge when the painter Edwin Landseer was a fellow guest. She was at a ball in London where the Duke of Wellington was present. She was initially rather horrified to see society ladies reach out to touch the great man as he passed (she was a prim girl), but when she found herself immediately behind him I am glad to say she proved her humanity by stroking his collar. In Edinburgh she stayed at the house of an elderly aunt who late in life had married an eminent Scottish jurist, Thomas Thomson, and there enjoyed some of the best literary society north of the border. She stayed often at Winchester with her uncle, Colonel Reed (later General Sir Thomas Reed), though it must be said that what charmed her at Winchester was not the prevalence of fine uniformed officers, but rather the cathedral and the cathedral system in that English church. What she saw as the completeness, the ordered richness and depth of a world within a world, came as a revelation to the pious young woman from a semi-rural Irish parish. However, life in that Irish parish was the principal world where her heart, hand and mind found fulfilment—firstly, of course, in worship, and secondly in practical charitable work, in teaching the Anglican faith and in writing hymns and poetry intended as aids to children’s learning. I would never sneer at the charitable efforts of the Victorians among the poor, the old and the disabled. We must remember that there were then no district nurses, health visitors, home helps, old-age pensions, social workers, meals on wheels or travelling Citizens’ Advice Bureaux. There was no provision for the mentally ill or handicapped outside what were called lunatic asylums, and although workhouses were being established people struggled to keep out of them. Dispensary doctors and the clergy and influential men like Major Humphreys were only too glad to turn to women like Fanny and her sister Anne for help tor the needy. Her father gave his backing, in the form of a small disused building, to the sisters’ effort to begin teaching the deaf. This little endeavour, the first in the north-west of Ireland, nourished to the extent that within seven years the diocese of Derry and Raphoe took it over, and in 1850 the Bishop of the day laid the foundation stone of a purpose-built boarding-school for deaf boys and girls in the outskirts of Strabane. For five years in her late twenties and early thirties Fanny’s life was all emotional peaks and troughs great happiness and great sorrows. The feelings welling within her in response were never, however, apparent outside her family circle. She was throughout her life reserved, dignified and even in her behaviour. How pleased she must have been, however, when in 1846 her Verses for Holy Seasons was given what we would call a rave review in the Irish Ecclesiastical Journal. This book of hymns was intended by Fanny for use by the clergy and Sunday School teachers and included questions for examinations. Her pleasure was all the sweeter since she had quietly fallen in love with her book’s reviewer. He was William Archer Butler, a Professor of Moral Philosophy at Trinity College, Dublin, who was also the rector of Raymochy near Dunfanaghy in County Donegal. A very decorous friendship grew between the two and was, it seems, ripening nearly to the point of an engagement when, owing to his efforts among the hard-hit local population during the potato famine. Archer Butler caught famine fever (typhus) and died very suddenly in July 1848. This loss came only 18 months after Fanny’s friend Lady Harriet had died of tuberculosis when only 26 years old. Between these great sorrows had come the happiness of seeing her sister Anne marry the Rector of Boyle in County Roscommon. Another lift for the spirits was the publication of Hymns for Little Children. Among its hymns are ‘All things bright and beautiful’, ‘Once in royal David’s city’ and ‘There is a green hill far away’, hymns which ever since have struck chords in the hearts of millions in the English-speaking world. Not long after the appearance of Hymns for Little Children Fanny met the Revd William Alexander, six years her junior, a polished Oxford graduate and a fellow poet. He swept her off her feet and they were married in October 1850. Their honeymoon was spent in the enormous comfort and charm of the mansion of Baronscourt, lent to the bride and groom for a few weeks by the Marquis. This was to be a very happy union. It seems to have been regarded by both from the outset as an equal partnership of happy lovers serving God and humankind through the channel of William’s position in the Church of Ireland. There is no hint of subservience in Fanny’s writing at any time in the marriage. Neither can one detect any hint of authoritarianism in William’s character as a husband. Of course, Fanny was older than he and had her own financial resources. Her father almost certainly settled on her the sum of £3,000 on her marriage. This would have produced a small income for her exclusive use. She had a modest income from her publications, some of which did go to the school for the deaf, and also a little more from her occasional writing for the Dublin University Magazine. At this time William was the rector of the parish of Termonamongan at Killeter, near Castlederg in West Tyrone. This is a very quiet, remote area of mixed farming and pasture land, modest mountains and lakes. William’s parishioners numbered around 1,500. There were a few Methodists, about 500 Presbyterians, and about 5,000 Roman Catholics. The young Alexanders threw themselves into parish work with enthusiasm and as a team. Irish parishes are divided into sections called townlands, and Fanny made a list of every one of these in Termonamongan and entered the names of the residents of every house with particulars about attendance at Sunday School, Confirmation and Holy Communion. From William’s dictation she drew up an analysis of a book on the Catechism for use in schools. She walked everywhere, as did William—perhaps as a measure of economy, or because so many parishioners’ homes were in inaccessible places. They were on good terms with the local Roman Catholic priest. Father John McCullagh, who was quite happy for Fanny to visit sick or needy members of his flock. The Alexanders’ First child, a boy called Jocelyn (known as Joe), arrived at Killeter in 1852 and it is surely no coincidence that in that year, turning to writing hymns for adults, Fanny produced ‘The roseate hues of early dawn’ and ‘Jesus calls us o’er the tumult of our life’s wild restless sea’. Anyone who has shared a house with a small baby knows about ‘early dawns’, to say nothing of ‘life’s wild restless sea’! William rose steadily in the Church, and each move was advantageous. In 1855 he was appointed to Upper Fahan on the shores of beautiful Lough Swilly in County Donegal, just as a second son, Cecil John, arrived. Happy in Killeter, Fanny and William were even happier in Fahan. Although three really tragic events disturbed them greatly. In 1856 the school for the deaf burned down and six pupils perished. A year later in June, William’s 21–year old brother, who was serving with the Army in India, was shot through the heart at the beginning of the Indian Mutiny. Only three months after this William’s great friend, the Revd Robert Higginbotham, a curate in Derry cathedral, died suddenly of typhus. Two of Fanny’s hymns date from the year following this period. These are a hymn for Lent, ‘When wounded sore the stricken soul lies bleeding and unbound’, and one for Ascensiontide, ‘The golden gates are lifted up’. The Alexanders’ next move was back to Strabane in 1860, when William became rector of Camus-juxta-Moume (the official name for the parish). For Fanny this was a return to scenes of her youth. The rectory was near the house where her elderly parents still lived, just outside the town. Fanny was now 42, and had just given birth to her fourth and last child. This move made fewer calls on her time as a helpmeet for her husband, for William now had a curate and a band of parish visitors. She divided her time between her children and her literary interests, and felt free to accept a commission from the London publisher Alexander Macmillan. This was to compile an anthology of poetry for children which would be suitable Sabbath reading—not necessarily religious and not doctrinal. Her editorship of the resulting successful Sunday Book of Poetry was considered so satisfactory that Macmillan approached her again a few years later for similar work, but by that time she was a Bishop’s wife and felt that she could not afford the time. Her best-known hymn from this period seems to be ‘He is risen. He is risen, tell it out with joyful voice’. Fanny’s children did all survive to fulfilled adulthood, but before that they accompanied her and William to the grandeur of life in a Victorian Bishop’s Palace in the year 1867. This was in Londonderry, when William was made Bishop of Derry and Raphoe at the age of 43. How to describe the variety and nature of the changes in all their lives which arose from this move? ‘Seismic’ springs to mind. For example, finance. They were now wealthy people. William had the Bishop’s crest on his carriage doors and a seat in the House of Lords. His income from lands and Fisheries alone was in the region of £10,000 a year. His palace and gardens were rent free. Fanny would never want for solid material blessings in her lifetime. Even when, very soon afterwards in 1869, the crushing blow of Disestablishment fell on the Church of Ireland and every part of the life of its clergy had to be examined and reordered, William could still live in great comfort. The Alexanders’ social position in the city could now be said to match the height of the building they lived in—nothing was above it except the cathedral spire. When, one year later, the Lord Lieutenant of Ireland and his wife, the then Duke and Duchess of Abercorn, visited Londonderry in the Duke’s official capacity, they and their retinue stayed at the Palace with Fanny and William. There were two grand luncheons and a glittering evening reception under Fanny’s own roof. For months before and possibly afterwards there was upheaval and excitement, perhaps eclipsed only some years later in 1885 when, in the course of a visit to Ireland, the Prince and Princess of Wales (later Edward VII and Queen Alexandra) came to Derry and had lunch in the dining room of the Bishop’s Palace. Look down, Lord of Heaven, on our desolation! Fallen, fallen, fallen is now our country’s crown. Ammon and Amalek tread our borders down. I have so far concentrated on Mrs Alexander’s hymns, but she produced an enormous body of other work. The best of this appeared two years after her death in a collection compiled by her husband. It runs to 462 pages, and contains five translations from the French, 18 poems on Old Testament subjects and 15 from the New Testament. Twenty-six poems are classed as narrative and imaginative, and 13 as miscellaneous. Ten are ‘Songs for children’ and ten are memorial verses. This anthology does also, of course, contain a number of hymns—51—representative of the 150-odd produced in her lifetime. Until William’s elevation he and Fanny had always been great companions in their leisure time, but sadly, in an excess of zeal for duty, they agreed together that these happy hours should be sacrificed. No more shared poetry, no more translating together the works of Victor Hugo, no more shared intellectual diversions, no more literary delights. All time henceforth was to be given to duty—duty to their Church, their diocese, their country, their own family and the family of Man. They kept this foolish resolve, but at some cost to their marriage. They were always fond, but outside pressures without the counterbalance of their old shared creativity and enjoyment saw their lives become more distinctly separate. Fanny’s dedication to duty embraced attendance at family prayers, perusal of the Scriptures and Psalms of the day according to the Church’s use, plus going daily to a cathedral service. Correspondence was attended to punctiliously, her household carefully ordered. Since the Palace is adjacent to an area of smaller houses which in those days saw acute poverty and want, she was a welcome and frequent visitor, together with their daughters as they grew. Always innovative, Fanny was a founder member of the Londonderry District Nursing Society in 1890, and took the chair at every meeting until a few months before her death. 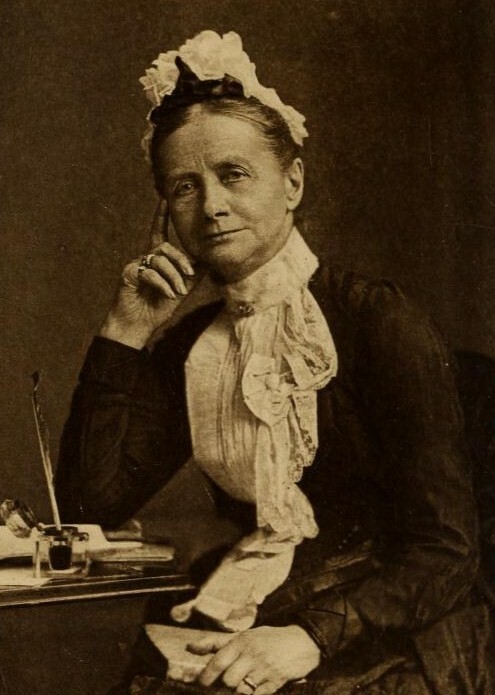 She strongly supported the work of the Girls’ Friendly Society which, also in 1890, opened a safe lodging-house for country girls coming to work in the city. Battered women and children were also a concern, and she was associated with a refuge in Londonderry called in its day, of course, ‘The Home for Fallen Women’. William was away from home at the far side of his diocese when Fanny suffered a massive stroke which left her in a coma. She had already had a lesser one a few weeks previously, but had been thought to be recovering. She died on Saturday 12 October 1895, aged 77. The reaction to her death throughout the kingdom surprised even her family. All the major English and Irish newspapers wrote about her and reported at length on the funeral. One wreath took the form of an Irish harp with silver strings entwined with lily of the valley; one of these strings was broken to denote the death of the sweet singer. Ninety-two clergymen attended the funeral, headed by the Lord Primate, Dr Robert Gregg. He shared a carriage with the Duke and Duchess of Abercorn. A mass of ordinary people of all denominations lined the streets to see the cortege pass. Many wore black. Blinds were drawn, shop windows shuttered. It was a beautiful autumn ‘Indian summer’ day, and William look comfort from the silent support of all those around him. However, when he stepped forward at the graveside to read the prayer of committal, this seasoned churchman heard his own voice break with sobs as the reality of ‘Earth to earth, ashes to ashes, dust to dust’ struck home. It was a grievous loss. The poor man at his gate. The poor man in his straw-roofed cottage. The old man’s voice, the child’s first whisper. He [God] listens and He answers all. If this latter verse reflects a belief that the poor and the rich, the old and the young, are all level in God’s hearing, then perhaps the other lines (published two years later) have been misunderstood. Perhaps they are not a definition of God as a defender of the status quo, which they have unfairly been assumed to be. If one reads aloud ‘God made them high or lowly, and order’d their estate’ with the emphasis on God and or while paying proper attention to the punctuation, it is possible to interpret Mrs Alexander’s lines as a reproof to those of her day who thought the poor somehow less worthy than themselves or made of different clay. After all, the whole hymn ‘All things bright and beautiful’ is essentially a list of God’s wonderfully created works visible around us. In every verse, each item is given equal weight in its beauty and praiseworthiness. Mrs Alexander’s mention of two kinds of human beings is more probably intended as an assertion of equality in God’s eyes than as the insertion of a political statement into what is a bubblingly joyful song for children.